We’ve got twelve new, never-before published, Christmas-themed cozy mysteries in a boxed set from twelve, bestselling cozy authors. And what’s a cozy without a pet? 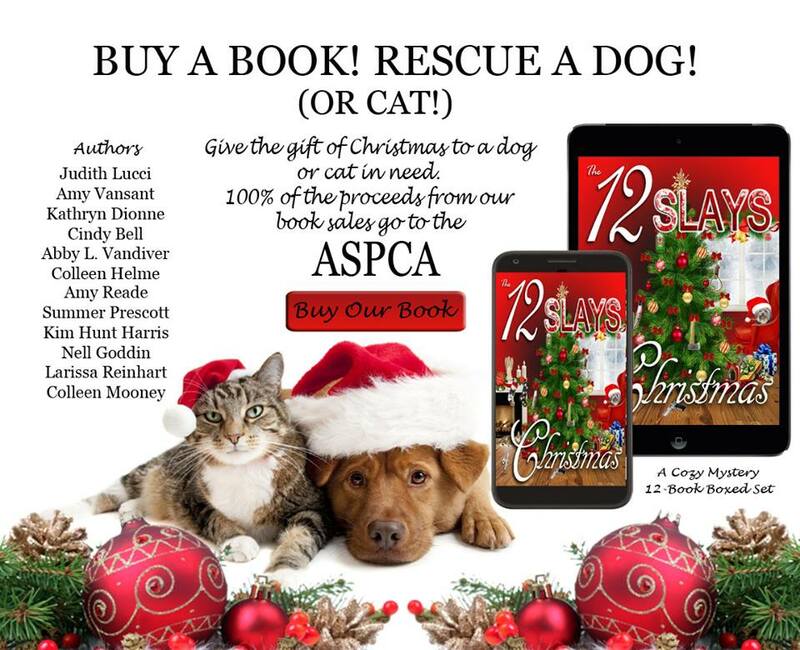 To help spread some of the Christmas spirit, the authors of The 12 Slays of Christmas, along with sharing our Christmas whodunit stories, are donating all of the proceeds from our boxed set to an animal rescue shelter to help cats and dogs in need – and you can be a part of it all! Won’t you help a dog or cat in need this holiday season? Through her various occupations, Abby discovered her love of writing. She’d always been told she had a gift for telling stories, combining the two, she became an author. Her debut novel, the mystery/sci-fi, In the Beginning, Book I in the Mars Origin “I” Series was an Amazon #1 bestseller. It was written on a whim, packed away, and rediscovered some twelve years later. After publishing it in 2013, Abby decided to make writing a full-time endeavor. She’s penned a slew of novels since then and has even more in her head. Although she writes mostly mystery, she’s written a historical/women’s fiction novel. It was co-written with author and friend, Kathryn Dionne under the pen name Kathryn Longino. Currently she is working on her first cozy mystery series. There will be at least five in the series, three, Bed & Breakfast Bedlam, Coastal Cottage Calamity, and Maya Mound Mayhem have already been published and are Amazon international bestsellers. USA Today Bestselling author Amy M. Reade writes women’s contemporary and gothic fiction. Her books have been compared to authors such as Daphne du Maurier, Phyllis Whitney, and Victoria Holt. Amy’s standalone novels feature vivid descriptions of exotic and fascinating locations, such as the Thousand Islands region of New York State, Charleston, South Carolina, and the Big Island of Hawaii. Most recently, she has been working on The Malice series, set in the United Kingdom. She loves interacting with fans when the dog isn’t laying on top of her, so stop by her blog or Twitter and say hi! Colleen Helme is the author of the best-selling Shelby Nichols Adventure Series, a wildly entertaining and highly humorous series about Shelby Nichols, a woman with the ability to read minds. When asked if reading minds is something Colleen wishes she could do she says, “No way! It gets Shelby into so much trouble that I would never want that ability.” Known for her laugh since she was a kid, Colleen has always tried to find the humor in every situation and continues to enjoy writing about Shelby’s adventures. Besides writing, she loves reading, biking, hiking, and playing board and card games with family and friends. She loves to connect with readers and admits that fans of the series keep her writing. I am born and raised in New Orleans. I started going to parades and watched them from sitting on my Dad’s shoulders before I could walk. I’ve been in Girl Scout parades, high school parades, St. Patrick’s parades, Mardi Gras parades, on dance teams in parades and just about any loosely organized group who deemed it necessary to parade. I just can’t help myself. I love parades. I attended Loyola of the South here in New Orleans so I wouldn’t be far from a parade. I spent 20+ years working for and retired from AT&T. I have worked and lived in New York City, Madison, New Jersey, Atlanta, Georgia and Birmingham, Alabama returning home for the big parade every year–Mardi Gras. I’m an avid sailor and Scuba diver for many years, and made lasting friendships from sailing and dive trips. I love travel and if the opportunity presents itself, I’m there. Except for a brief stint where I had to own and learn how to ride a motorcycle, I’ve been a water baby. When I am not enjoying fun with friends in all New Orleans has to offer- sailing and racing with friends on Lake Pontchartrain, Mardi Gras, parties and festivals- I head to Florida. I am an ardent animal lover and direct volunteer breed rescue work as Schnauzer Rescue of Louisiana. I love to write and I write about what I know and love! You can take the girl out of New Orleans, but you can’t take the New Orleans out of the girl! Dead & Breakfast, the second book in my series THE NEW ORLEANS GO CUP CHRONICLES placed in two categories in the 2014 SOLA Chapter of RWA’s Dixie Kane contest for Short/Long Series for Contemporary fiction and for Single Title Contemporary fiction. My first book is RESCUED BY A KISS. Judith Lucci is an international best-selling author. She writes what she knows…..Hospitals, Patients, Physicians and Health Care. She adds suspense and intrigue along with well-constructed plots, vivid descriptions, and memorable characters, and produces medical thrillers that few readers can put down. Dr. Lucci is the author of the Alexandra Destephano Series, a series of medical thrillers that offer fans an escape into the busy world of a fictitious world-class hospital in New Orleans. The protagonist is Alexandra Destephano, a nurse-attorney who leaves her home in Virginia to become the legal counsel for a large New Orleans hospital. Lucci’s thrillers are a fast-paced, riveting glimpses in the reality of hospitals that offer reader’s believable drama, and an extraordinary read that allow them to escape into the complex, often mysterious world of health care. There are currently five novels in The Alexandra Destephano series. She has also written a children’s book called, Derek the Fireless Dragon. It is collection of illustrated humorous poems and rhyming stories suitable for children of all ages. Under the pen name Kathryn Longino, Kathryn has partnered with author Abby L. Vandiver and wrote, At the End of the Line, an Amazon #1 bestseller. The book is a women’s/historical fiction that spans from 1958 through 1972. It is a story of friendship, survival, and determination during one of the most tumultuous times in America’s history. Her family and Cairn Terrier, Biscuit, lived in Nagoya, Japan, but have returned to Georgia. You can see them on HGTV’s House Hunters International “Living for the Weekend in Nagoya” episode. Visit her website, find her chatting on Facebook, Instagram, and Goodreads, and sign up for her newsletter. Nell grew up in Richmond, Virginia and has lived in New England, New York City, and France. Currently she’s back in Virginia with teenagers and far too many pets. She has degrees from Dartmouth College and Columbia University. Growing up with a military dad, I’ve had the amazing experience of having lived all over the world – experiencing other cultures, customs and cuisines from an early age. Now that I’ve settled into a peaceful and pleasant adulthood in the Midwest, my loves in life are simple – a good book, some fine wine, and furry friends underfoot. I’ve found that Cozy Mystery readers are some of the nicest folks you’d ever want to meet, and I’m glad to have befriended many of you as I journey through this wonderful mystery called life.